New! Download and Print Your Own Self-Guided Tour Brochure! Download, print, come! It's easy to travel the Byway with this brochure. Mile by mile, community by community, this brief overview will help you to discover the beauty of the Byway. 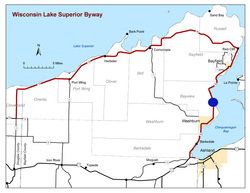 The WLSB begins in a traditionally agricultural area with small family dairy farms and the UW Agricultural Experimental Station. The six-mile drive to the City of Washburn parallels the shoreline of Chequamegon Bay and crosses over numerous streams that flow from the highlands above the Bay. To travel this trail is to follow an unfolding history of the region. Native flora and fauna sustain a healthy ecosystem. 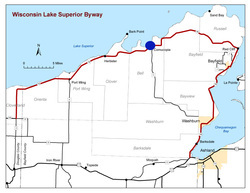 The landscape provides a delightful mixed view of Lake Superior, wetlands, and farmlands. Washburn, the first city along the WLSB was a boomtown from 1880 into the 1920’s. Here brownstown was quarried and shipped all over the country. Lumber mills processed timber logged from the surrounding area. The DuPont Company established the largest dynamite plant in the world during World War I. A historically interesting and scenic city, Washburn is situated between Lake Superior and the Chequamegon-Nicolet National Forest. Attesting to its historical significance, it has three buildings on the National and State Historical Registers and a pending National Historic District. One of these historic brownstone buildings houses the Washburn Historical Museum and Cultural Arts Center. 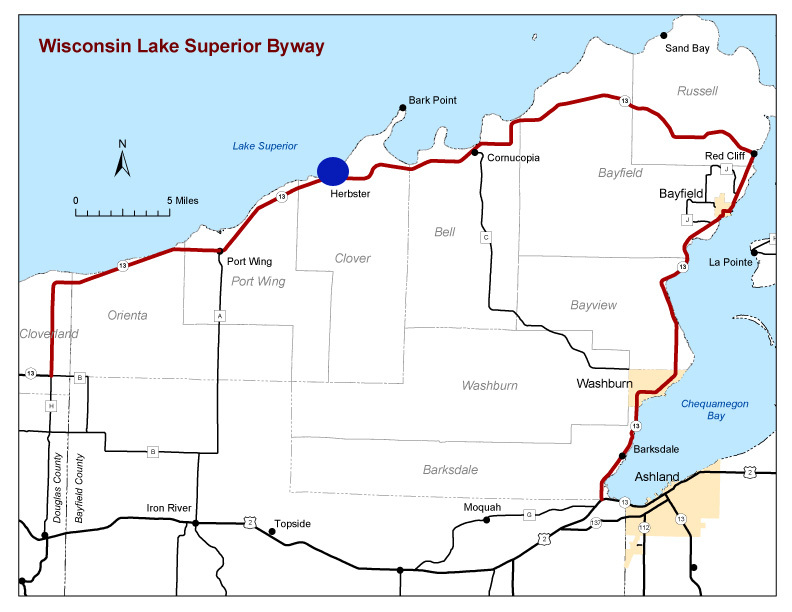 Visitors can enjoy Washburn’s 1.5-mile walking trail along the shoreline of Lake Superior. 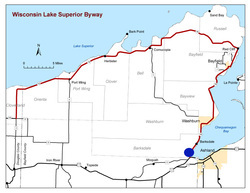 This area has a designation as a maritime Historic Trail and includes sandy beaches for swimming and boat launching, breath taking views of Lake Superior and signage about the history of the lumbering industry in the area. Washburn also boasts a thriving community of visual artists, musicians, writers and actors. A new 150-seat theater, StageNorth, faces Lake Superior and brings to the area quality music and theater productions. Keep watch along this stretch of the Byway for signs directing you to Mt Ashwabay Ski Hill. Home to downhill and cross country skiing in the winter; it is the summer home of Big Top Chautauqua. Reminiscent of the original Chautauqua tent shows, the Big Top brings local, national and international musical groups and talents to the area from June to September. As the traveler ascends a long hill into the City of Bayfield, many of the remaining Apostle Islands come into view. 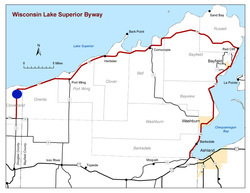 The City of Bayfield boasts a 1.3 miles historic district. Many of Bayfield’s historic structures were built in the late 1800’s and are listed on the National Register of Historic Places. A village of quaint cottages and magnificent Victorian homes, Bayfield offers a wealth of interesting lodging. In addition to its well-preserved historic architecture, Bayfield is known throughout the world as a premier sailing and boating destination. The Apostle Islands National Lakeshore Visitor Center provides fascinating historical information about the lighthouses of the islands through films, display, and a chance to get up close and personal with an actual light from a lighthouse. Bayfield’s marina is home to a ferry service to Madeline Island. The only Apostle Island that is not part of the National Lakeshore, Madeline Island is a collection of quaint shops and is home to Big Bay State Park. The hills above Bayfield are home to numerous orchards and berry farms. Apples, raspberries, blueberries and other seasonal fruits and vegetables thrive in the unique climate created by Lake Superior. Bayfield’s annual Apple Festival the first weekend in October brings tens of thousands of visitors to indulge in apple-everything. Leaving Bayfield the Byway enters the Red Cliff Band of Lake Superior Reservation. The Red Cliff Band is one of 154 Bands of Anishinaabeg that reside around the Lake Superior region in the United State and Canada. 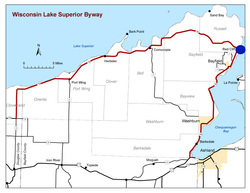 The Tribe has approximately 60 square miles of watershed/shoreline area, 46 miles of streams and rivers, and 22 miles of Lake Superior shoreline. Scenic sandstone cliffs characterize the near shore portion of the reservation and large protected wetland sloughs at the sandy mouths of pristine rivers. Red Cliff is home to several attractions including the Buffalo Bay Campground, Legendary Waters Resort and Casino, Red Cliff Tribal Fisheries, Frog Bay Tribal National Park and the Northern Aquaculture Demonstration Facility. The Little Sand Bay Recreational Area in the Town of Russell is adjacent to the National Park Service's popular kayak access point to the Apostle Islands. The July 4th Powwow and Celebration is a colorful annual event. The Byway makes a steep descent to Cornucopia, Wisconsin’s northern most town. The Cornucopia harbor provides a protected port for commercial fishing vessels and pleasure craft. Siskiwit Bay is protected and shallow and therefore offers some of the earliest swimming along the South shore. Just off the beach is an artisan well that runs clear, cold safe water all year long. Next to the beach is the “Green Shed” which houses the Cornucopia Museum. The museum offers a peek at the last 100 years of life on the rugged South Shore. Cornucopia also boasts Ehlers General Store - in operation for 100 years. Beyond Cornucopia watch for three Lost Creeks and see if you can find Lost Creek Falls. Take the Bark Bay Road to a wonderful estuary, Bark Bay Slough where you can kayak or canoe among a variety of bird and animal life and exotic water flora and wildflowers. At the small community of Herbster, the traveler can drive out Bark Bay Point Road. At the end of this peninsula you literally stand between Bark Bay on one side and Lake Superior on the other. A campground and sandy beach are available. Herbster’s annual spring smelt fry is held in a historic log gymnasium built by the Works Progress Administration. Leaving Herbster the Byway climbs steeply then crosses deep tree-lined ravines that fall steeply to Lake Superior at the rate of four or five each mile. Entering the community of Port Wing you’ll find a wealth of things happening in this often-overlooked little fishing village. Two commercial fishing boats still work out of the Port Wing harbor, the first harbor of refuge east of Duluth/Superior. The village retains much of its historical fishing and boating connection to Lake Superior. The nearly two miles of sand beaches provide access for swimming, beach combing, and watching some of the best sunsets that the South Shore has to offer. At the edge of Port Wing is Twin Falls, where there is a maintained trail that goes to an overlook at the upper rim of this scenic little waterfall that flows into a cool, stone-lined glen. 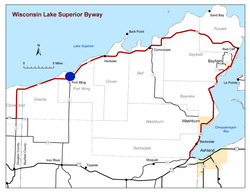 About 5 miles from Port Wing the Byway crosses Reefer Creek and a scenic pull out that provides great views of Lake Superior, including a 20-mile view across the lake to Knife River, Two Harbors and Silver Bay in Minnesota. From this point forward the Byway enters dense pine forests. Turn you attention here wildlife watching, where deer, eagles and the occasional wolf or bear move through the Brule River State Forest. Now is the time to watch for signs announcing the road to the mouth of the Brule River, a world famous trout stream and wilderness area. The final two miles of the Byway pass the historic Town of Cloverland cemetery and school. The Byway ends at the junction of County Road H the highway just prior to crossing the Brule River. At this junction, look back to get the last glimpse of Lake Superior until reaching the City of Superior.